"a cringy Hillary Clinton meme generator." Verrit will happily LIE to you about how she won he vote, citing some dodgy source. But if you are willing to research this yourself, you can find the truth. It's out there. 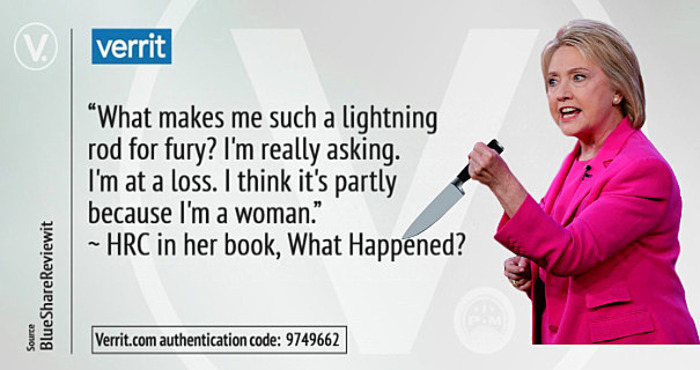 Someone should ask Verrit, Is Hillary Clinton satanic? Clinton surprised many of her followers over the weekend when she announced her personal support for a new and relatively unknown website called Verrit. Described as a "media platform for the 65.8 million" voters who supported Clinton, Verrit aims to organize supporters of the former first lady by providing them with verified facts. Hillary Rodham Clinton speaks at the 2017 Stephan Weiss Apple Awards on June 7, 2017 in New York City. Hillary Clinton endorsed a new political media platform on Sunday, shortly before an alleged cyberattack forced the website offline. 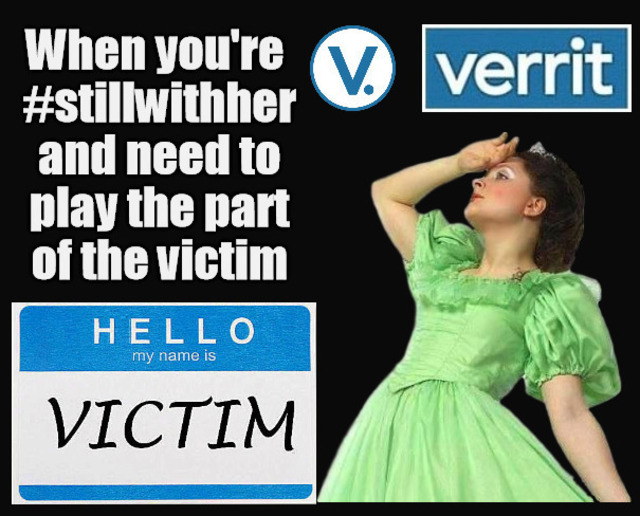 Described as a "media platform for the 65.8 million" voters who supported Clinton in last November's presidential election, Verrit aims to organize supporters of the former first lady by providing them with verified facts. Perhaps, all those dead Hillary voters tried to access all at once. 8 hours ago - Wait, who's creating these Verrit cards? Who's verifying that they contain authentic quotes, or accurate information, or any information at all? The latest Tweets from Verrit (@verrit). MEDIA FOR THE 65.8 MILLION. 1 day ago - A new website called Verrit is that nightmare coming full circle. While it may not have outlandish conspiracy theories or careless whoppers . Right after Trump took office, BuzzFeed News reporter Charlie Warzel described counter-programming on the right as “a parallel universe that operates as a mirror image of its mainstream counterpart with its own ‘alternative facts,’ audience, and interpretation of truth.” A new website called Verrit is that nightmare coming full circle. 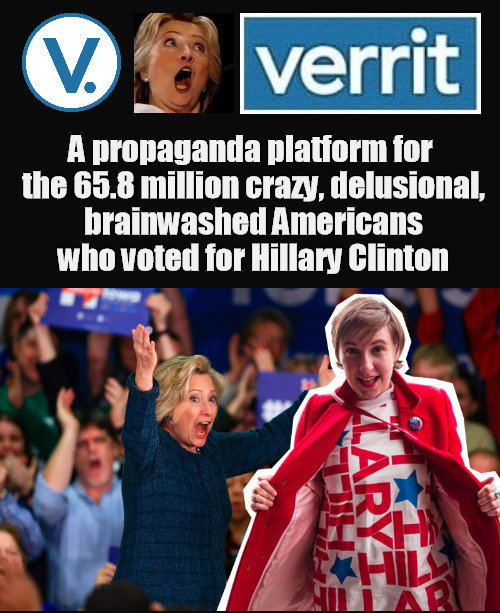 While it may not have outlandish conspiracy theories or careless whoppers (though there’s certainly plenty of that on the left, too), Verrit is counter-counter programming to the pro-Trump media: an enclave for liberal thoughts that is proudly and explicitly for “the 65.8 million” people who voted for Hillary Clinton in 2016. It’s the blue MAGA hat of websites. Verrit, created by Clinton stan Peter Daou, who coined the hashtag and website #HillaryMen, and took credit for creating The Huffington Post, promises “an unwavering commitment to truth and facts.” Many of those facts are just image macros with quotes from Hillary Clinton, who asked people to sign up for the website in a tweet on Sunday. Daou claims that Verrit was hit by both a DDOS attack and a “Hillary-hating frenzy” following Clinton’s tweet. THERE IS NO SANCTUARY IN THE MEDIA FOR HILLARY VOTERS. This (new) attempt to the Left to control things may (again) backfire. "I'm still not seeing anyone, apart from Bernie Sanders maybe, who can take on Trump"
This goes with all the other echo chambers at Youtube, Facebook, Google, etc. But it is less user friendly. Who is going to use it? What about being for all people? This is only for those who voted for Hillary"
- - Now Complete Laughing Stock Even to Liberals! BEST Hillary thread here on GEI? > Campaign 2016 threads: "Discernment"
... or make or continue to perpetuate a joke as a top-level comment. The site is widely being mocked due to a number of reasons. First off it's apparent with its "media for the 65.8 million" tagline, as well as Daou's own statements of the site acting as a "sanctuary" for Clinton's supporters to "reflect their worldview", that the site is meant to be nothing more than an echo-chamber for Hillary's supporters to make and share these cards with quotes they like on them. Second off, most people believe the site is doomed to fail, due to it not having any real other purpose than to make these cards and not having a userbase that's likely to stick around. And finally you have Peter Daou himself and his response to people mocking his website and his insistence that his site was actually cyber attacked. It's essentially a cringy Hillary Clinton meme generator. See, I struggle to call it a news site, or even an opinion site. Its just quotes on a background image, and when you find the image, it links it to the source material. What I find interesting is that it puts quotes out there, but then allows you to 'see it in context' if you search by its verrit code. But then it claims to be a fact checking site, with no fact checking. Honestly, it seems to be more of a click bait farm for news sites than anything. Er, ah, I would think Hillary's bad behavior & personality is what has generated her-harvest-of hatred from so many. The DNC became the mechanism through which the ambitious Hillary conspired to seize power illegally. If "valuing" women means giving them more privileges than me, this is destroying our society. Women's desire to virtue-signal using the money of others is another huge danger brought by SJW women. "Pity Me" Hillary "feels mistreated by everybody"
"I have never seen anyone as immature as she is"
"She blames everyone for her lost except the one most responsible... that's herself, of course"
She needs to be silenced - she is embarrassing herself and her party. 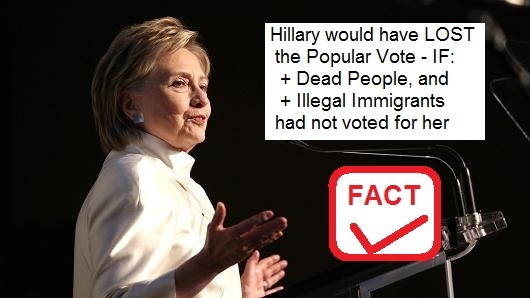 Hillary Clinton believes that were it not for James Comey, Russia, Wikileaks, Facebook, fake news, voter ID laws, or America's "endemic" sexism and misogyny, she would currently be president of the United States. In just under two minutes, Clinton rattled off eight separate excuses for losing the 2016 election. "I went from 26 points ahead to 13 points ahead, and I needed about 18 points in order to be sure to win Pennsylvania," Clinton said of the impact of Comey's notorious letter explaining he was re-opening the investigation. "I watched how analysts who I have a great deal of respect for, like Nate Silver, burrowed into all the data and said that 'but for that Comey letter, she would have won.'" "So it was very personal to me," she said in an interview with CBS's Jane Pauley. "I think my general election prospects were badly damaged because of that, so that even though I was starting to come back, it was not enough time to overcome it." Clinton also rattled off Russia, Wikileaks, and even fake news as other culprits in her failed presidential run. "But even though [the Comey letter] was the primary blow to my campaign at the very end, it has to be looked at in context -- with the Russians weaponizing information, negative stories about me; this whole Wikileaks beginning to leak in early October of John Podesta's emails -- which if you read them all were, they're pretty anodyne, but they were taken out of context; stories were made up about them." I may start calling her "the female Hitler"
She's on her way to being either the most-ridiculed, or most hated woman in History. Which I would regard as an appropriate place of record for "the satanic one"
Her evil may well rub off on her daughter. I no longer want her jailed, & on death row. I want her complaining to go on-and-on, with her ridiculed more and more. When she walks in a room, I want everyone to roll their eyes & think: "What! Is she still here!?" 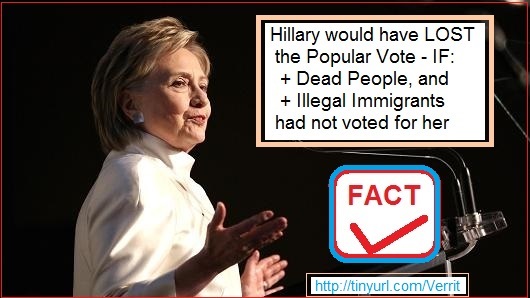 In “What Happened,” Clinton falsely alleged that Wisconsin’s new voter ID law prevented 200,000 people from voting. As the link above shows, it's more than "Who does he think he is kidding in considering a run?" The dark horse appears to be Facebook's Mark Zuckerberg. Virginia Gov. 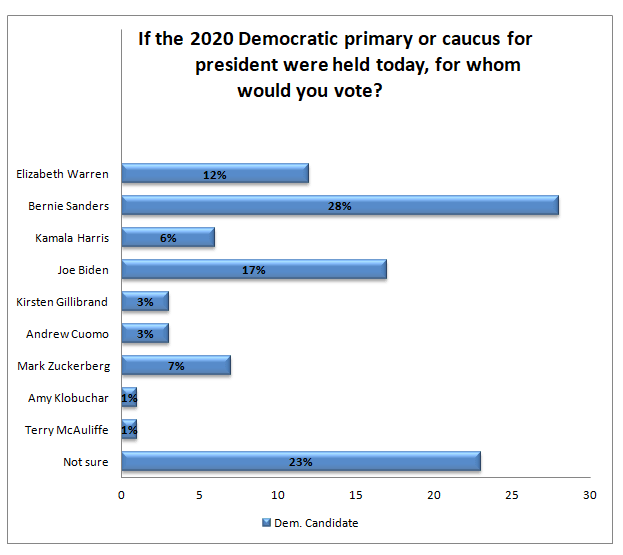 Terry McAuliffe, a media and Clinton favorite, is dead last with just 1 percent supporting his candidacy in the Zogby Analytics survey of likely Democratic primary voters provided exclusively to Secrets. Amy Klobochar seems a better candidate than Zuckerburg or McAuliffe precisely because no one has ever heard of her. An anonymous SJW would be better also... Or maybe Kathy Griffin..
Onec upon a time, his ties with the Clintons would have helped The Joker, but no more. As popular as Clinton remains among many liberals, she has also become a divisive figure inside her own party. She recovered from the bitterly divisive primary fight against Obama in 2008, in no small part because Obama brought her into the fold as his first secretary of state, but the wounds from her surprisingly competitive battle against Sen. Bernie Sanders, I-Vt., are still fresh. In fact, Clinton devotes space in What Happened to pouring salt in those wounds. "His attacks caused lasting damage, making it harder to unify progressives in the general election and paving the way for Trump's 'Crooked Hillary' campaign," she writes of Sanders. While Clinton certainly took considerable friendly fire from Sanders supporters, the septuagenarian senator turned unlikely hero to liberal millennials was actually slow to attack her and said he was sick of hearing about her "damn emails." This reticence didn't last throughout the primaries but Sanders wasn't as tough on Clinton as Clinton was on Obama. Adding importance to her Hillary interview, a sneezing Panda viewed 200 million times. And perhaps 1-2 million did, and maybe twice that number of illegal immigrants. Amazon is battling claims that it deleted hundreds of one-star reviews of Hillary Clinton’s new book about the 2016 campaign, “What Happened,” and says that it doesn’t delete reviews because they are negative. Clinton's book was officially released on Tuesday, and by Wednesday morning, there were more than 1,600 reviews posted, with an almost even split between positive and negative reviews. About 50 percent of reviewers had given it five stars and 49 percent only one star. The average rating, according to Quartz, was 3.2. By Wednesday evening, however, there were only 460 reviews left on the site. All were marked "Verified Purchase" — indicating the reviewer had purchased the book on Amazon. May take an extra 1-2 days to ship. Really? Russia helped elect Trump? 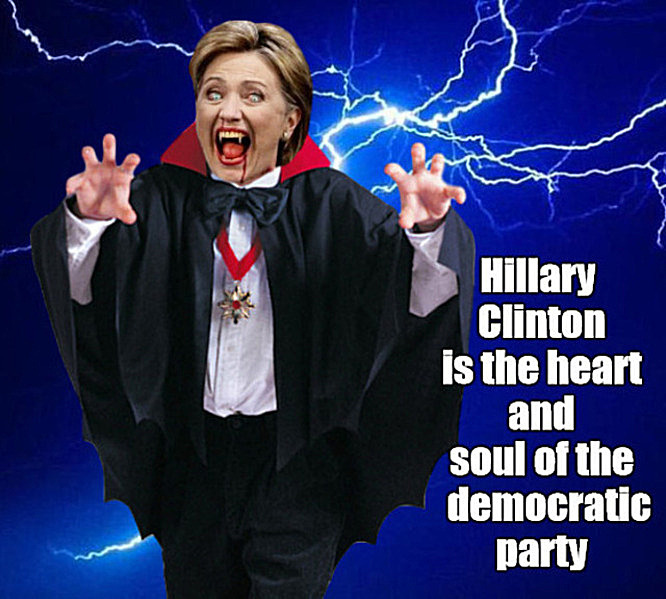 Did they make HELLary such a god-awful candidate ?? The NYT "editor" sees it as his mission to "ruin the Trump brand"
The scumbag's previous job: "he worked for the Hiillary campaign"
SHOCKING: Within the FBI then, were the same people who are investigating Trump's "Russia connections" now. - under the name SXR Uranium One Inc. In 2007 Uranium One acquired a controlling interest in UrAsia Energy,a Canadian firm with headquarters in Vancouver, from Frank Giustra.UrAsia Energy has interests in rich uranium operations in Kazakhstan. UrAsia Energy's acquisition of its Kazakhstan uranium interests from Kazatomprom followed a trip to Almaty in 2005 by Giustra and former U.S. President Bill Clinton where they met with Nursultan Nazarbayev, the leader of Kazakhstan. 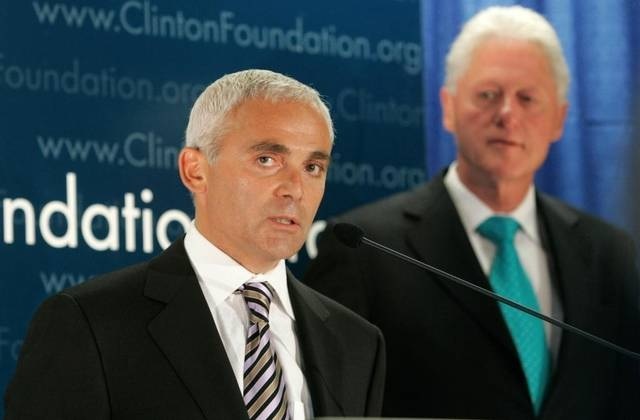 Substantial contributions to the Clinton Foundation by Giustra followed.The Podesta Group then lobbied on behalf of Uranium One"
Big money was made by UrAsia shareholders - the stock Doubled! 2010 - The US APPROVED the Sale of Uranium one, under the direction of Secretary Clinton. $145 million of donations were made to Clinton Foundations. 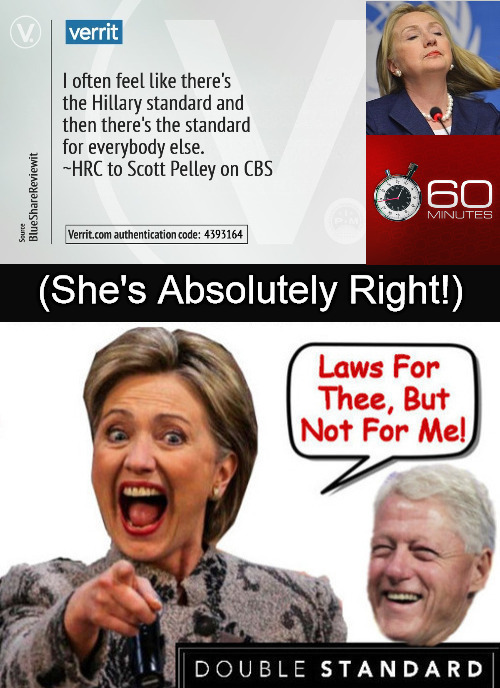 Do Hillary's band of brainwashed Useful Idiots really believe this Big Lie! JP: "If Trump was colluding with Russia, then why go through Wikileaks?" OS: "Hillary claims to be UNAWARE that she paid $6 million for the Dirty Fake dossier"
Does anyone with an IQ above room temperature believe this? JP: "Hillary is lying. She has been lying for a long time. These are two of her capabilities: Obstruction, and Lying." I tried to get in several times, and could not. Its a website that describes itself as media for the 65.8 million a reference to the number of Americans who voted for Hillary Clinton in the 2016 US presidential election. Brendan James, one of the co-hosts of the leftist political comedy podcast Chapo Trap House is no fan of Clinton. But he also says he isnt convinced by the concept behind the site. Its not really a social media site because you cant upload anything to the site, you cant post your own material and these arent really facts hes disseminating, he tells BBC Trending radio. I dare say even the more rabid Hillary voters dont quite know what to do with [Verrits]. I suppose you could pass them round like a meme, or use them in a little argument you might get in an email chain with your aunt, he says. Although Clintons tweet received more than 22,000 likes, Verrit has not gone hugely viral. Its Twitter account has only about 60,000 followers, and its Facebook page has about 12,000. Daou says he doesnt take the criticism personally, and argues that the reaction shows he must be doing something right and that his critics are scared of Hillary Clinton and Verrit. If her voice is being reflected in Verrit then she is here to stay, he says. I think long term, the idea of Verrit being here to stay does frighten people who dont want that view to be expressed. Unsurprisingly, Brendan James from Chapo Trap House takes quite a different line: Well, thats sort of the only thing you can say when youve failed miserably in doing what you set out to do if it were true that all of these people who voted for Hillary were as adoring of her as Peter is, this venture would make sense and they would all be clamouring for this service. Unfortunately I think the number of people who are really dying for this number in their dozens not their millions, he says. 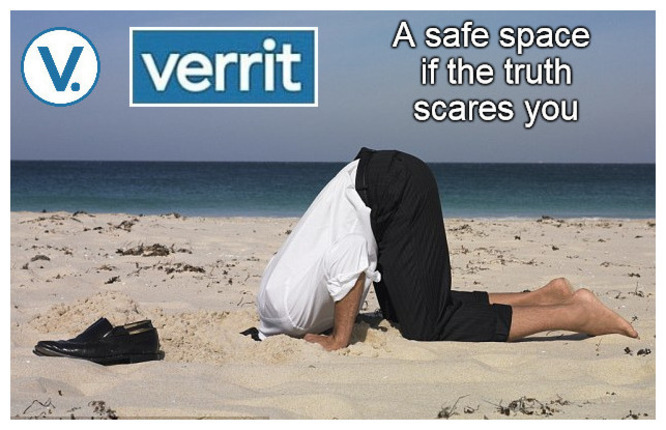 It's a safe space for her supporters who are too scared of the truth. It's a place to go when you're still with her and you need to play the part of the victim. Hillary supporters get the job done. Apparently their job was not to get Hillary elected. Hillary Clinton is an honest, ethical, accomplished leader who made history in 2016. She was the first woman ever to become a major U.S. party nominee. And she won the popular vote by a comfortable margin, garnering more votes than anyone other than Barack Obama in 2008.
, someone who has always been the tip of the spear in the fight for women’s rights, health care, and many other core progressive policies. She should be treated with the dignity and respect she has earned over the decades, not shunned or brushed away. 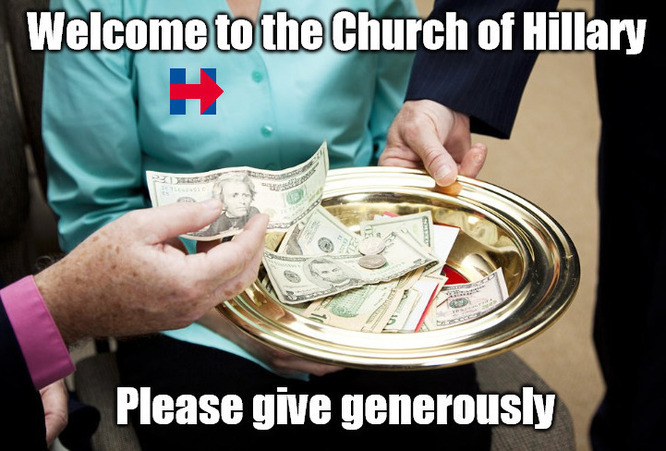 Visiting that website is like going to church to worship Hillary. What would be happening right now if Hillary Clinton were president?